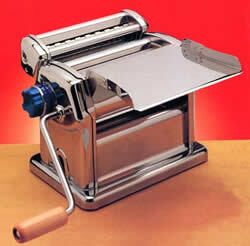 The most popular pasta maker among home chefs and connoisseurs around the world. Made of chromium plated steel with tmpered steel gears, self-lubricating bushings, and dough rollers with 10 adjustable settings. The most popular pasta maker among home chefs and connoisseurs around the world.Made of chromium plated steel with tmpered steel gears, self-lubricating bushings, and dough rollers with 10 adjustable settings. 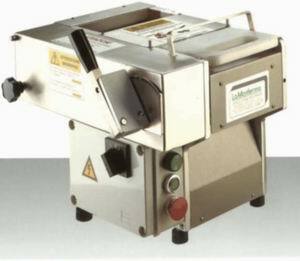 NINA is a bench top machine for producing rolled pasta and very thin, delicate, transparent sheets. TAGLIATELLE in two widths, mm 2 and mm 6, can be obtained with NINA in its standard version. On request it is possible to vary the sizes of tagliatelle from the standard version. 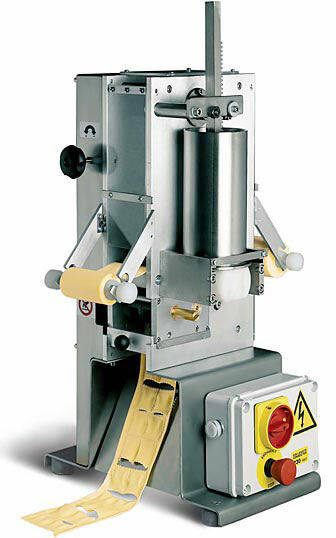 Multipurpose machine for the automatic production of FINE-ROLLED PASTA SHEETS and, with special sets, RAVIOLI, TAGLIATELLE, GNOCCHI and PASTA of different sizes and shapes. 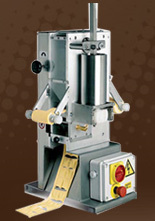 The machine can knead and roll pasta simultaneously. 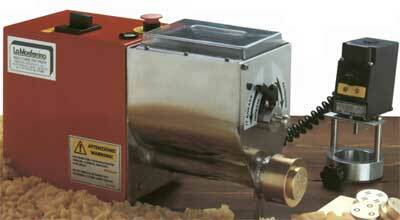 Its operation is simple and convenient, and all components can be removed for cleaning and servicing. Rediscover the pleasure of making pasta with DOLLY! Small, compact and reliable, DOLLY is suitable for small restaurants, for the party rooms and kitchens of people with a lot of friends and in all situations where small amounts need to be produced. 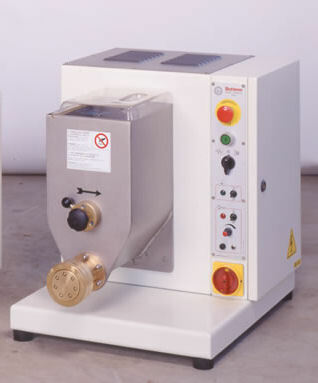 DOLLY can work any type of flour and can also prepare dough for pizzas and bread. 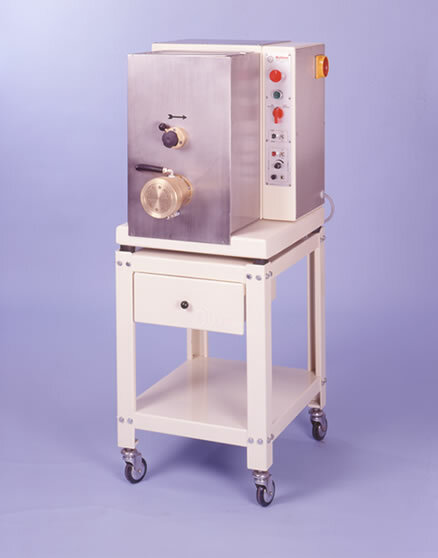 All the components that come into contact with the dough are made of pure, never-changing STAINLESS STEEL. DIES: dies made of bronze are available to get pasta with a rougher finish or of PTFE for smooth, transparent pasta. One of the most popular dishes in any cuisine is undoubtedly the pasta. Fresh pasta not only can be used to prepare all of the traditional pasta dishes but will also allow the talented chef to use his own creativity to try to create as many new dishes as the number of ingredients he has available (spinach, beets, carrots, tomatoes, cocoa, etc.). 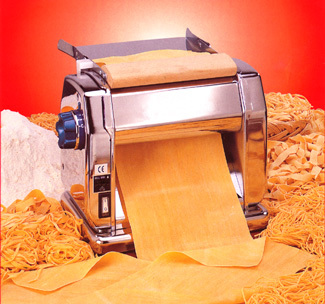 Pasta machine PM96 is a strong machine, pratical and simple to use. It is possible to produce various type of fresh pasta with any type of flour, with or without eggs. It is economic because it allows you to dose with pleasure the ingredients and you can offer the very hight quality of fresh pasta at the same cost of normal dry pasta. It is a simple and pratical to use machine. It is possible to produce various fresh pastas with any type of flour, with or without eggs and even coloured pastas: red with tomato sauce, green with spinach, brown with cocoa and long or short pastas for "pastasciutta" and vegetable soups. It is economic because it allows you to add as many ingredients as you like offering you fresh egg-pasta every day at the same cost of a normal dry pasta without eggs. You can also make pasta without eggs, using hard corn and water, if you want to economize. With this machine it is possible to produce different ravioli shapes (rectangular, round, 1/2 moon etc.) and dose the amount of filling. It is made of excellent quality material, all finished in stainless steel, it is strong and easy to use and complies with current safety standards. 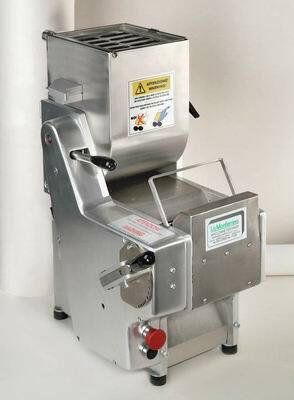 The pasta sheet used with this ravioli machine can be produced with any of our pasta machines.